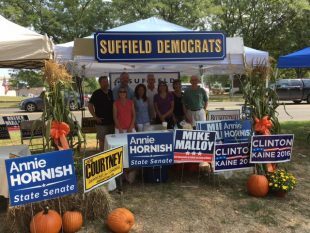 Candidates Annie Hornish running for the 7th Senate District and Mike Malloy running for the 61st House District joined DTC members to meet voters and visitors at Suffield on the Green. They had a regular stream of visitors to talk with about state and local government topics. Suffield cartoonist Rick Stromoski joined them to make drawings for dozens of kids.